This site introduces wide varieties of abstract strategy games from all over the world. Abstract strategy games are games with perfect information, no chance, and usually for two players or teams, in which victory or defeat is determined only with the intellectual ability. It is interesting to know that, for example, a Japanese classic abstract strategy game, Shogi has a long and fascinating history and so many curious variants in the world. There are varieties of original games that are created by professional game creators or amateur fans, and published and distributed by game companies. 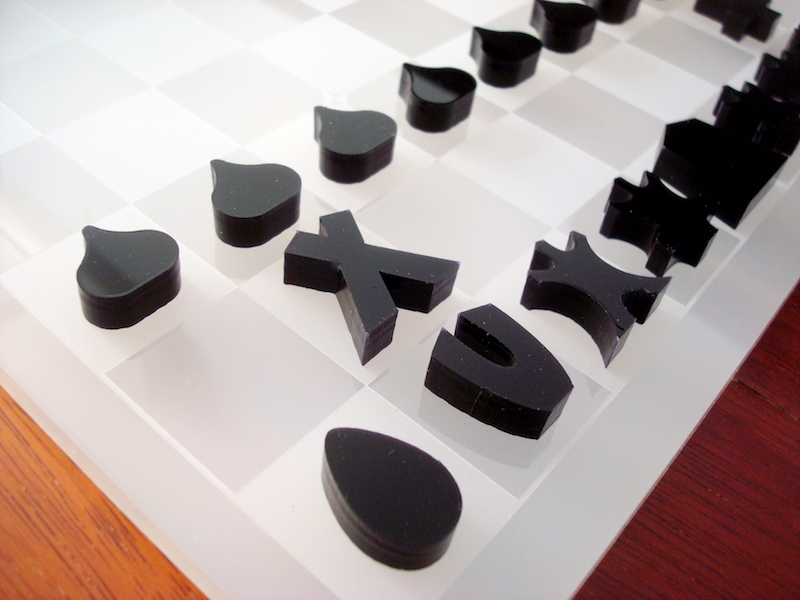 Unfortunately, abstract strategy games are losing ground to other games these days. There are certain games that you can never find in the market or you can hardly find any information on them however hard you try. We would like to contribute to helping the situation: We will make the boards and pieces downloadable, the game applications playable online, and the software libraries that are used for the game programming available here. We also discuss related subjects such as computer science, mathematics, and culture, not only introduce the descriptions of the games or the books talk about them, wishing to help to develop a deeper understanding for abstract strategy games. For any questions, requests, or comments, please contact us. Already a great stir on twitter and facebook! Cool and Innovative shogi perfecto, a revolutionary 将棋, has been released with great collaboration with Néstor! shogi perfecto (English) will be on sale at Game Market 2016 Autumn! The Museum is exhibiting and selling more than 25 games, including mamy new games from nestorgames and original games of the Museum. Official blog is updated everyday. Don't miss it! The Hero is going to save the world from the evil Satan ... by beating her at board games! In the episode 7, the Heroines are playing Masahiro Nakajima's FlipFlop! We are pleased to announce "Fano330-R-Morris (English) and Varanasi (English) The World Championship 2016" will be held. inpHeXion WON the FIRST PRIZE in BEST COMBINATORIAL 2-PLAYER GAME OF 2014 that selects the best combinatorial game *1 of 2014 at the world biggest website / database of board games, BoardGameGeek. This event has been held every year for three years. Museum's original games Amoeba, Varanasi and inpHeXion have been released from Nestor Games, a Spanish company, one of the world's biggest publisher of abstract strategy games. Amoeba and Varanasi are out. Nestor Games' products are designed very nicely: Simple yet gracefully finished boards and pieces are very different. Our original games FlipFlop, Amoeba, Honey Donuts, and Renaissance have been out from Gift Box Co., Ltd.. They are extremely beautifully made in tiles: Pieces are nicely weighty in hand. They are made to order. The game instructions are in Japanese.